SAILKARMA.COM - Sailing News, Videos and Photos! : SpeedDream: Quest for the fastest monohull on the planet. SpeedDream: Quest for the fastest monohull on the planet. 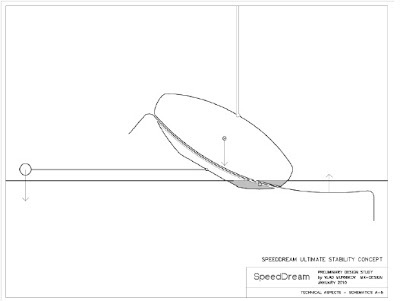 In this News Release the SpeedDream team lifts (only slightly) the veil surrounding their revolutionary design concept and shares some ideas on how they plan to advance monohull performance to a totally new level. “We want the sailing public to be aware of our campaign and to get involved in the SpeedDream challenge with their ideas, comments and support,” says design coordinator Vlad Murnikov. 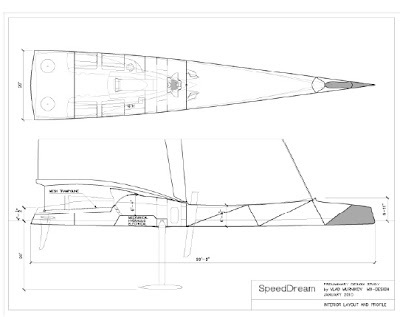 The SpeedDream campaign, the quest to create the world’s fastest monohull, is gaining momentum. The reaction to the SpeedDream announcement in early January was overwhelmingly positive demonstrating that the sailing world is ready for a radical super-fast monohull, capable of competing on equal terms with the record-setting multihulls. “For decades catamarans and trimarans have proven themselves to be the fastest boats under sail," says Murnikov. "All this time these multihulls have enjoyed unrestricted development leaving their designers free to explore every possible recipe for speed. Monohull development, on the other hand, has always been governed by strict class rules which puts a big damper on single-hull performance capabilities." Today’s fastest monohull, the VOR 70, is a relatively conservative design developed in accordance with a stringent 'box' rule in order to keep all boats similar and to reduce costs, and risks, associated with the ultimate ocean race. These rules put limits on length, beam, draft, displacement, rig dimensions, and sail area, all the major design parameters, as well as materials that can be used for boat’s construction. And yet, despite all these restrictions, VOR 70s are capable of reaching speeds in excess of 40 knots, the same as some of the fastest multihulls. The problem is, much wider and shorter monohulls tend to slow down after each burst of speed, while catamarans and trimarans, with their needle-like hull forms, can sustain higher speeds for a substantially longer periods of time. This explains why multihulls dominate the record pages. The SpeedDream team believes, however, that the current superior multihull performance could be matched and even exceeded by a monohull if we are able to throw away all restrictions and design the most advanced boat possible. Generally, light boats are fast. Monohull critics are quick to point out that the ballast weight that a traditional single-hull boat has to carry in order to achieve sufficient stability is dead weight most of the time. Recent advancements in canting keel design allow for enormous gains in stability while reducing ballast weight. In fact you can hardly call a canting keel a “keel”. It’s more accurately a ‘stability strut’ that adds power in a very efficient and effective manner. It’s true that multihulls don’t need ballast for generating righting moment but they do have to carry around the weight of at least one or even two extra hulls, plus all the complex structure necessary to keep it all together. When SpeedDream is built, the boat will effect the sailing community in more profound ways than any speed-record multihull could ever do simply because the vast majority of sailboats on water are monohulls. The design innovation and research that will go into this project, and the experience gained from it, will benefit the future of sailboat design and set the direction for generations of yachts to come. High performance results from a combination of two main factors: providing a boat with enough power and reducing resistance in order to utilize this power in the most efficient way possible. Most designers focus performance optimization on increasing power. Multihulls are typical of this approach as they grow larger and wider with each new generation in order to achieve higher and higher sailcarrying capability. This, however, results in over-powered vessels that are inevitably over-stressed requiring a more and more robust structure to survive. This all comes at the expense of extra weight which in turn calls for even more power to maintain speed. “Our solution is to reduce drag, by all means possible,” says Vlad Murnikov. “This way all the available wind power is used more efficiently requiring less sail area to achieve higher speeds. Less righting moment is needed, the boat is less stressed and will be lighter while remaining strong. Lighter means faster”. To greatly reduce resistance the SpeedDream boat features a relatively narrow, slender hull, almost triangular in plan view and equipped with a sharp wave-piercing bow. The goal is to reduce drag in heavy seas as well as minimize pitching and slamming. The boat is designed to sail most of time at a constant heel angle of around 20-25 degrees. This angle of heel will be maintained by adjusting sail area and keel angle in accordance to the changes in wind strength. Both the hull and rig are optimized to be most efficient in such conditions with the hull having two narrow planing surfaces port and starboard, each tilted at 20-25 degrees. Further design development will concentrate on verifying the optimal heel angle and determining both the shape and width of the planing surfaces in order to achieve the best combination of maximum hydrodynamic lift and minimal hull drag. The resulting hull design will have minimal volume and surface area with its buoyancy and hydraulic lift moved as far outboard as possible. VOR 70 rules limit keel cant to 40 degrees. The geometry of most modern canting systems allows for a maximum cant of up to 50 degrees. Beyond 50 degrees the loads grow dangerously high. For SpeedDream we have developed a proprietary system that allows much higher cant angles while at the same time being able to significantly reduce loads. The goal is to ultimately sail the boat with the keel completely out of water thereby removing a significant amount of drag. Even if the keel is going get submerged periodically, on the whole this concept promises sizable benefits to overall drag reduction. Wings were first attached to the keel in 1983 to help the Australians win the America’s Cup. Recently we saw a huge wing sail propelling BMW Oracle to its victory. Now the SpeedDream designers are looking closer at wings, trying to utilize uniquely shaped hydrofoils to create additional righting moment and to partially offset the boat’s displacement. Placed near the center of gravity to diminish the negative effect of hull movement on their performance, these foils will be capable of creating lift equal to 30-50% of the total displacement. The wings could be retractable or fixed and could be used as separate appendages or in combination with a daggerboard. The parameters of the wing will be decided in the later stages of design process. Further analysis will be focused on finding the optimal size and shape of the hydrofoils and their profile in order to achieve maximum lift and minimal drag. It’s hard to underestimate the importance of the deck design and layout as it relates to performance since at high speed the deck will frequently get submerged. Its shape will be sculptured to shed water as quickly and to throw as little water and spray forward as possible and to prevent large amounts of water reaching the cockpit. All of this will help reduce resistance and provide the best protection for the crew. “Naturally the task of protecting the crew from the elements on a boat intended to reach 50+ knots in real ocean conditions is an enormous design challenge, but we have a few interesting tricks up our sleeve that will help make this inevitably wet boat a little bit less wet and more comfortable for her crew,” says Murnikov. 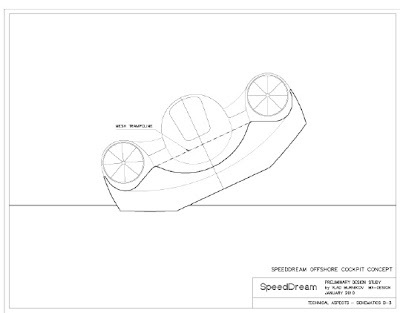 All the functional attributes of the SpeedDream design also contribute to the boat’s strikingly futuristic image. “I view design as part science and part art and believe that beautiful boats are fast boats. This boat looks like nothing ever seen before and to my eye she is very beautiful, and therefore she has to be very fast,” jokes designer Murnikov. 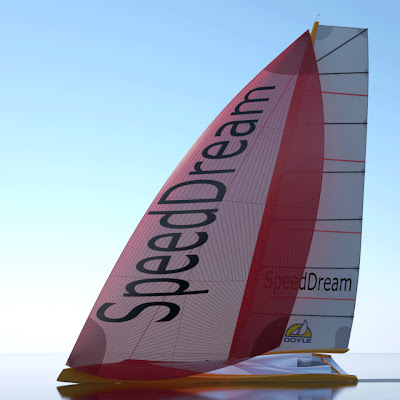 SpeedDream is the brainchild of Vlad Murnikov, a radical sailboat designer, born in Russia, now based in the USA. 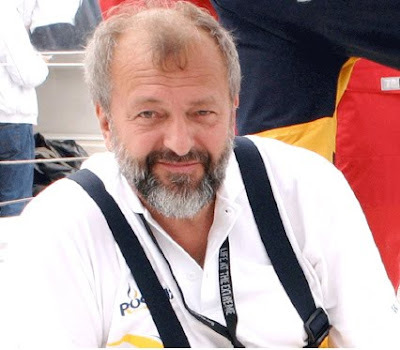 Vlad was the project leader and design coordinator for FAZISI, Russia's first-ever entry in the Whitbread Round the World Race, the premier oceanic sailing competition in the world, now known as the Volvo Ocean Race. In the 1989-90 Whitbread race, not only did the remarkable FAZISI with her minimal budget and crew of novice sailors overcome impossible odds to place 11th in a field of the world’s best yachts, she posted the nextto- longest 24-hour run racking up the then-incredible 386 miles in a single day. FAZISI was one of the lightest boats in the entire Whitbread fleet. Although the almost twice-as–heavy, over-canvassed New Zealand ketch STEINLAGER won the race under the command of the legendary skipper Peter Blake, the light-displacement boats ultimately prevailed in the design competition. Today they fully dominate the racing scene getting lighter and faster with every new generation. Murnikov’s unique SpeedDream concept improves upon the once-revolutionary FAZISI blueprint and advances the scientific art of boat design into yet uncharted territory. Another trend-setting design that influenced the SpeedDream concept was MX-Ray, a revolutionary boat that forever changed small boat sailing. When Murnikov came up with the idea of super-fast, singlehanded dinghy with asymmetric spinnaker, nobody believed that the concept could work or that there would be sailors skillful enough to handle such a boat. Not only did the tiny 13-foot MX-Ray proved to be extremely fast, capable of reaching 27 knots, she turned out to be great fun and very easy to operate. Over the years more that a half-dozen designs from various manufacturers followed in her wake, and today practically every dinghy producer has a similar boat in their line-up. It is from the MX-Ray that the SpeedDream concept has borrowed her sharp wavepiercing bow, very narrow waterline, and dart-shaped hull. 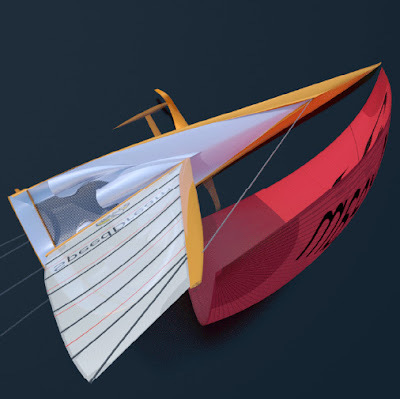 Other members of the SpeedDream design team are bringing their cutting edge expertise in offshore racing boats, record multihulls, hydrodynamics, structural engineering, hydrofoil and keel design. 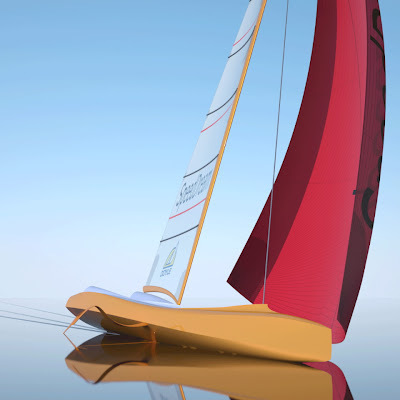 On top of this SpeedDream’s innovative rig and sails are going be developed by industry leaders. We are confident that our team is capable of producing the fastest sailboat ever.